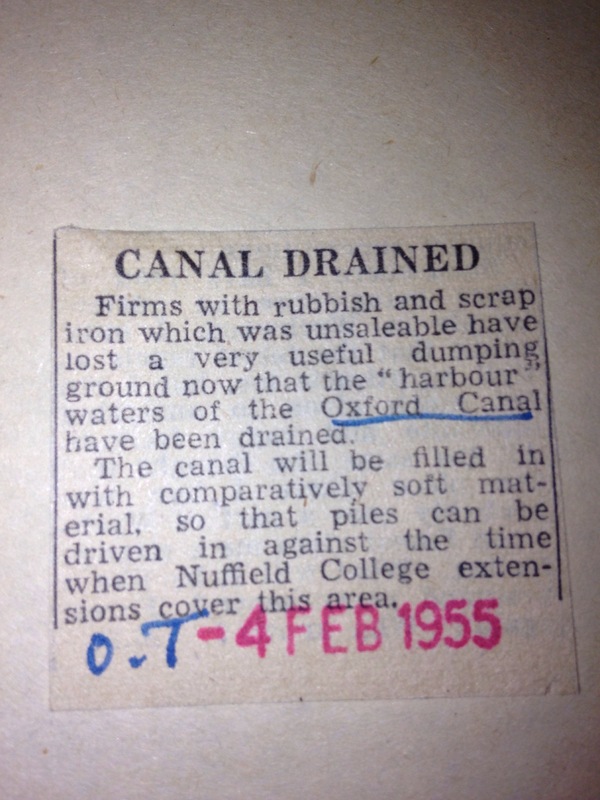 So, I spent a day trawling through The Oxford Times and Oxford Mail archives looking for stories and tales to do with The Oxford Canal, and I owe Chris McDowell (resident archivist and man everyone wants on their team in a pub quiz) a great big thank-you for all of his help and patience with me – he’s a brilliant man! Anyway, below is a list of some of the places where interesting ‘happenings’ have taken place along the canal as it flows towards, and passes through Oxford city centre – there were plenty more stories littering other parts of this 78-mile-long stretch of waterway, but as this exhibition is taking place in Oxford I’ve decided to keep it local. I’ve also made the decision not to include the dates of the occurrences, or details of the occurrences that would enable people to date them, as the point of Wait ’til it Settles is that there’s more to this canal than meets the eye. History has made the canal what it is today, the good, the bad and the ugly – the underlying stories that have carved out its meandering shape, its physicality, its locks, its railings, its paths, its warning signs, its lifebuoys, its beauty spots, its cottages, its cottaging! Water from some of these locations will be displayed at The Jam Factory from 1st to 28th April 2014 as part of the Inspired the Canal exhibition.